Wentworth Golf Club played host to the 1953 Ryder Cup matches between the USA and Great Britain. Team Captains were Lloyd Mangrum (US) and Henry Cotton (GB). This was one of the most fiercely contested competitions in Ryder Cup history and the Americans had to wait until the closing stages of the singles matches before gaining a single point victory. Peter Alliss took a six at the final hole to lose 1-up to Jim Turnesa and Bernard Hunt missed a putt on the 18th green to halve with Dave Douglas. U.S. Captain Lloyd Mangrum said he would “never, never captain an American team again because of the 9,000 deaths I suffered in the last hour”. USA 6 ½ - GB 5 ½. The Ryder Cup was played at Pinehurst in 1951 and at Thunderbird in 1955. 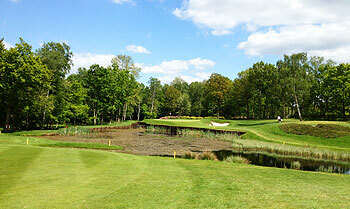 The West course at the Wentworth Club is the most famous of the Surrey heath and heather courses. The club is also the most televised in Britain, once hosting three professional tournaments every year (World Matchplay, PGA and the Seniors Masters), but now only the PGA Championship is staged annually at Wentworth. The West course was also the venue for the fiercely contested 1953 Ryder Cup, resulting in a single point American victory 6½ 5½. It must have been an absolute delight for Harry Colt when he was asked to design the West course, which opened for play in 1926. After all, he was already familiar with this landscape, having designed the East Course (founded two years earlier). The West is a relative youngster in the scheme of things. Many of Surrey’s famous sand-belt courses were established around the turn of the 19th century. Wentworth was also one of the first golf course developments to feature fairway-side houses, quite a number of which are owned by well-known celebrities. It’s a sort of up-market 1920s golf and country club complex. Bernard Darwin refers to the West Course as the Tiger Course in his book, Golf Between Two Wars. He writes: “The course is intended to test that rampacious animal to the full. It is a little hard to assign the Wentworth country as a whole to any precise class. There is heather and there are trees and yet it is not quite of the same nature as its near neighbour, Sunningdale. It is set in park-like surroundings, and yet it is certainly not what is usually called a park course. It is a cross between the two, although the Tiger Course has about it least of the park and most of the heathery character”. At the start of the Second World War, the Army requisitioned the clubhouse and labyrinths of underground bunkers were built. Deep below the famous clubhouse lies a secret wartime HQ. It was the Second World War that gave rise to the other name for the West Course – “Burma Road”. The course was allowed to grow wild because it was feared that enemy aircraft might land on the fairways. Towards the end of the war, German prisoners were brought in from a nearby internment camp to clear the course. One of the officers overseeing the clearance operation reputedly said: “Let this be their Burma Road”. There are many memorable holes on the West course. The 2nd is a charming, exacting short 155-yard par three; a huge sentry oak stands between two bunkers guarding the right-hand side of the plateau green, the tee is level with the green, but the tee shot must carry across a valley to find the putting surface, don’t be short. Next, we come to the 3rd, a brutal, uprising 448-yard par four; avoid the bunkers on the right-hand side of the fairway, positioned 250 yards from the tee. Otherwise any chance of reaching the green in two has gone. A crisp accurate long iron or a fairway wood will reach the huge, 37-yard deep, three-tiered green that is protected by a bunker to the left and a bunker to the right; three-putting is commonplace. The 13th is yet another of the West’s long par fours (par five for the ladies). The hole sweeps around to the left, the green is invisible from the tee; the obvious line for the tee shot is down the right-hand side of the fairway, but here lies a cleverly located bunker. A good drive down the right of the fairway will leave a tough approach to a subtly contoured green that is protected by two bunkers to the left and two to the right. A par here will definitely feel as good as a birdie. 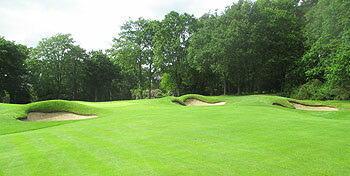 The last hole we'll mention is the famous bunkerless 17th. It’s a huge 566-yard par five that seemingly sweeps infinitely to the left – from the narrow tee there are tall trees on both sides, creating a tunnelling effect. A footpath dissects the hole some 200 yards away. The ball must be struck down the right-hand side of the fairway – anything left will be blocked out by trees or, worse still, out-of-bounds. Only the longest hitters should take the strategic line down the left side of the fairway, a solid 300-yard swish will make it to the corner of the dogleg. The approach shot is played blindly over a rise, aim for the large oak in the distance, but be aware that everything slopes onto the green and then everything seemingly slithers off again. "Feel the heritage, feel the glamour, feel special in strangely familiar surroundings." When you step onto the first tee of the West course, you will feel an overwhelming sense of familiarity. It is definitely a place most people would be more than happy to call home and play the monthly medal here for the rest of their lives. The holes weave their way through sprinklings of heather and across gently undulating terrain with mature trees lining each and every fairway. This is a truly classy golf course and it's a tough one too, especially after Ernie Els gave the West a new set of teeth. It now measures more than 7,300 yards from the tips and with many new bunkers and some new tiger tees, the Burma Road is now a serious 21st century challenge. The West course closed to visitors for twelve months from 1st June 2009 for an extensive £6.5m renovation programme. Ernie Els was in charge of the changes which included 18 new USGA specification greens, new bunkers and a new canal-like stream, which protects the green on the famous closing hole. The new-look Burma Road received mainly positive comments from the pros at the 2010 BMW PGA Championship, but Paul Casey argued that the changes had stripped the West course of its character. Click here for the 2010 press release – “All Change On The West”. Ernie Els was against the changes to the 18th, and the green was lowered for the 2011 event with the depth of the putting surface extended to invite second shots. However, the 18th still proved to be too difficult for most pros and the vast majority opted to play the home hole as a three-shotter. The 2011 PGA Championship took its toll on most of the field but the play-off was all set to be a thrilling affair featuring World No.1 Lee Westwood and World No.2 Luke Donald pitching their wits in a sudden death head-to-head on the 18th. Neither player opted to go for the green in two and both players had similar pitches into the green. Donald judged his pitch and spin to perfection but Westwood’s pitch spun off the green into the new canal. The play-off turned into a flop rather than a thriller. Donald not only claimed the PGA Championship title but also knocked Westwood off the World Number One spot in the process. The West course closed immediately after the 2016 PGA Championship for yet another major redevelopment. Ernie Els Design, in conjunction with European Golf Design, were commissioned to handle the renovations, which includes the redesign of five greens, the installation of sub-air systems on every green (the first of its kind in England) and a reduction in the number of bunkers. The project completed prior to the 2017 PGA Championship. I felt I should write a review as there have been none since the club went private and the west course was redesigned following harsh criticism of the old design. This is now relatively old news as two BMWs have been played since. As can be researched from many points of feedback from PGA tour pros the new course has met with unanimous high enthusiasm. I have played with many on it both low handicappers and mid and without fail it is perceived as the best there is - taken on its own terms. What I mean is this. Do not compare to Sunningdale as it is a different product. I adore Sunningdale and I adore this but they are totally different so comparisons are odious - but make no mistake Wentworth has many things Sunningdale nor indeed perhaps any other course on these shores has (and before you shout from the roof tops... vice versa with Sunningdale). What are some aspects of the Wentworth West experience: the greens:- you may argue - well my greens are fast enough and true enough. All I would say is reserve judgement until you play them. It is likely a different experience to anything you have ever experienced, and it is not just the act of putting itself. It is the aesthetic quality of the contours of the greens combined with the flawless creeping bent grass and the beautiful surrounds that makes standing on the greens and taking it all in such an experience. I regularly hear best greens in country/ever played. The course is stunning and the redesign has enhanced the aesthetic brilliance moreso that even the original but not over the top and lots of subtle cambers etc which delight the eye. There are so many places on the course that just look amazing. It has 18 great and varied holes, which challenge you from first to last. Whilst it has been taken back more to the old Harry Colt design it needs to defend itself against the best in the game - which the original course did not (any more) and it is very technical around the greens mostly due to the thick grass, speed of greens and bunkers. I would imagine the play around the greens in more US PGA style, rather than links (heathland) style, and though I am no expert I think this is how it needed to play in order to be challenging for championship play. The technical challenge it presents will tax you to the full but is an absolute joy to take on and you get to play shots perhaps you would not be able to play many places.... ie have to chip on to a 2 foot patch of green only to see the ball roll Augusta style all the way down to the hole. Add to this the peace of the round, the relaxation of the half way hut, and the impeccable course condition which is result of the new structure, and every time you play there it doesn't feel like just another round... it feels like a very special occasion. A word or two about the new club structure. The work and the investment by the new owners is nothing short of outstanding. Beyond the West, the Clubhouse is wonderful 5 star environment and an absolute joy to relax in, and contributes to a highly relaxing and enjoyable day. I have played Wentworth many times over the years but since the changes I have to say that is not a course I enjoy playing. The bunkers are almost impossible for anyone to get out of unless your a tour player. The greens have become overly undulating, I am not sure how they find a pin position on 16! The condition of the course is also disappointing apart from the fairways which are fabulous. It is a shame as it is a great place to visit but given the choice I would rather play the East or The Edinburgh. For me the best part of Wentworth was the facility which is certainly top notch. As far as the West course is concerned, it has been ruined by renovations. Sure conditioning is great, greens are fast etc etc, it’s a true championship course set up for the pros. I really don’t mind tough golf but for this was a little too much of a slog. Naturally, it was also playing rather wet with no roll but too many holes were driver, 3 wood holes in my opinion, then on top of that the green renovations were also not done to my liking. Too many raised greens. Raised greens on 480-yard par 4’s is again made for people that hit their drive 300 plus yards. I guess one could argue we should have chosen our tees better and perhaps played the ladies tees and perhaps you’d be right. However, for me the course just lacks variety and I’m sure Colt is turning over in his grave at what’s been made of his once masterpiece.Everything else about the resort is top notch. The other courses are also enjoyable and much more playable for mere mortals. Played for the first time and thoroughly enjoyed the experience. I was surprised how playable the course was for a relatively high handicapper (15). The fairways are wide so tee shots are not intimidating and lost balls were not an issue. Course and setting are beautiful and the challenge lies around the greens which were hard and fast. On some greens chips or even putts ended up rolling back off the green and a fairly conservative approach is required if you want to score. We played in warm dry weather with a breeze: pretty much ideal conditions and a few weeks after the PGA Championship. Here I have to admit that I was playing as part of a corporate event so didn't pay a green fee. At best, a very good parkland course. This is not proper golf in the Surrey heathlands and, whilst it's a name every novice golfer knows, it's one of the great Harry Colt's poorest courses. Possibly that's a little unfair to Colt, given that the club and Ernie have now done much to make it horribly Americana but, nonetheless, it was never amongst Colt's greatest triumphs. If you want to experience outstanding golf in Surrey, play 36 holes at Sunningdale for the same price you'll pay at Wentworth for 18. It's worthy of a place in the Top 50 but ultimately it's nothing more than a pleasant tourist trap. What really amazed me about the Wentworth property was the overwhelming parkland nature of the three courses, especially if you consider that Sunningdale, with its revered heathland fairways, lies immediately to the south west. If parkland golf is your thing, then the West course is probably the finest example of that golfing genre in the whole of England. It’s a BIG track – 6716 yards off the regular yellow tees – so if you don’t hit a long ball, don’t expect to be scoring 30+ Stableford points. On the other hand, if you’re a professional, you’ll love it around here – why else would this place have held so many big money tournaments if it wasn’t geared up to challenge the men who make a living out of the game? Bunkers apart, which were compacted with hard sand after recent heavy rain, the conditioning of the course was simply superb (no surprise, considering the BMW PGA had just finished the week before). The recent high profile facelift to renovate much of Colt’s work may well extend the life of the course as a major tournament venue but I can understand why many will question (a) the price paid in millions of pounds, and (b) a perceived loss of architectural integrity. Overall, Wentworth’s a brilliant golf experience, especially if you’re given the chance to indulge in an overnight stay. The West is certainly the talisman track at Wentworth but if I was a member here, I’d be inclined to play the East more often than either the Edinburgh or the West. Very good review, why on earth golfers pay this type of money for a parkland course is beyond me, for 1/3 the price you can get the real deal at The Berkshire or Walton Heath, and for £30 you can play East Berkshire for a proper heathland experience. Wentworth is as tough of a parkland course that you will find anywhere. I agree it is expensive and not a links course but you get to experience golf where the pros play. A must visit! The West is now a competition course that's far too hard for the average to good player. I've been playing there for 30 years and now the enjoyment has gone especially as the greens are so fragile, they get them right for the PGA then struggle for the rest of the year. If I'd ever paid more than £100 I'd be straight down the cop shop to report a robbery! I played the West Course in late March. The greens were slow,uneven and the grass was very patchy. The course has a definite feel of parkland about it with very little heather and lush fairway grass. Those looking for a high quality heathland experience would be sorely disappointed.